The Corporation also wins if the Runner is flatlined and the Runner wins if the Corporation must draw a card from his empty draw deck. 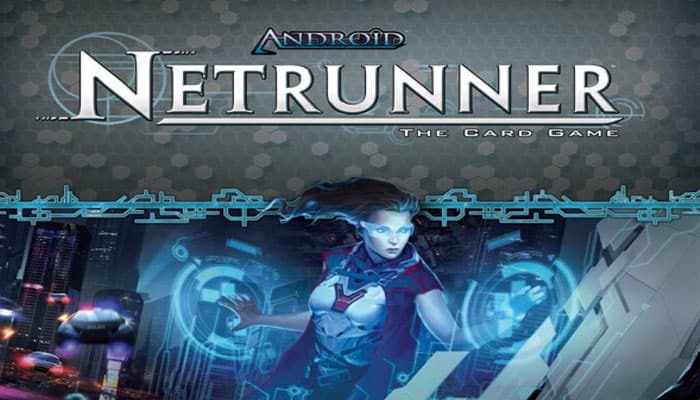 To prepare a game of Android: Netrunner, carefully follow the steps below. Choose Sides: The players decide who will play as the Runner and who will play as the Corporation. Then, each player places his identity card faceup in his play area and takes a corresponding deck. Note: New players should use the Shaper and Jinteki starter decks for their first game. Create Token Bank: Gather the credits, advancement, brain damage, tag, bad publicity, and generic tokens into piles. Keep these piles within reach of both players. Collect Starting Credits: Each player takes five credits from the bank. Shuffle Decks: Each player shuffles his deck. After shuffling, each player offers his deck to his opponent for further shuffling. Draw Starting Hands: Each player draws five cards from the top of his deck to form his starting hand. After drawing starting hands, the Corporation may choose to take a mulligan by shuffling his hand back into his deck and then drawing a new starting hand. After the Corporation decides whether to mulligan, the Runner decides whether to mulligan as well. If a player takes a mulligan, he must keep his second hand as his starting hand. When the players are satisfied with their starting hands, each player places his deck facedown in his play area. 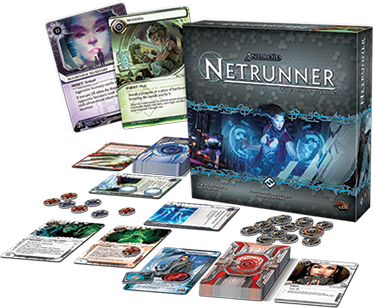 In Android: Netrunner, the Corporation and the Runner alternate taking turns. 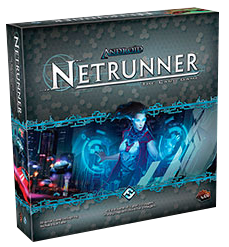 Android: Netrunner is unusual in that the Runner and the Corporation are governed by different rules. Players should familiarize themselves with the rules for both sides. The Corporation always takes the first turn of the game. Each player, during his turn, takes actions by spending clicks. A player can only spend his clicks during his own Action phase, and he must spend all of his clicks in each Action phase. The Corporation begins his turn with three clicks and the Runner begins his turn with four clicks. Draw Phase: The Corporation draws one card from R&D. Action Phase: The Corporation has three clicks with which to perform actions. Discard Phase: The Corporation discards down to his maximum hand size, if necessary. 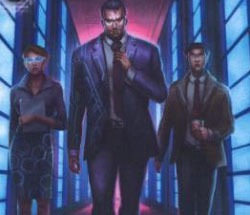 The Corporation draws the top card of R&D. This does not cost the Corporation any clicks. Note: If the Corporation's R&D is empty when he attempts to draw a card, the Runner immediately wins the game. In his Action phase, the Corporation takes actions by spending 3 clicks. He can only take actions during his Action phase, and he must spend all three of his clicks during his Action phase. The Corporation can perform any of the following actions as many times as he likes, and in any combination, provided he can pay for them. These are listed in the format of "cost: effect". 1 click: Draw one card from R&D. 1 click: Gain one credit. 1 click: Install an agenda, asset, upgrade, or piece of ice. 1 click: Play an operation. 1 click, one credit: Advance a card. 1 click, 2 credits: Trash a resource in the Runner's rig if the Runner is tagged. 3 clicks: Purge virus counters. Trigger a click ability on an active card (cost varies). Whenever the Corporation spends clicks on one of these actions, he is considered to be taking an action and cannot take another action until the current action fully resolves. When the Corporation has spent all of his clicks, his Action phase ends and his Discard phase begins. For one click, the Corporation draws the top card of R&D and adds it to HQ. For one credit, the Corporation takes 1 click from the bank and adds it to his credit pool. For one click, the Corporation installs a single agenda, asset, upgrade, or piece of ice from HQ, placing it facedown on the table. Note: When an asset or upgrade is installed, the Corporation can pay its rez cost to rez it at almost any time. Ice can only be rezzed when the Runner approaches it during a run. When installing a card in a server, the Corporation can first trash any cards already installed in that server. Trashed cards go to Archives faceup if they are rezzed, and facedown if they are unrezzed. If the Corporation chooses to create a remote server when installing a card, he installs the card by placing it facedown in a discrete location in his play area. Agendas, assets, upgrades, and ice can all be used to create a new remote server. If the Corporation creates a remote server by installing ice, the server exists, but is considered to be empty. An empty server can still be run against by the Runner. Agendas - An agenda can only be installed in a remote server. After an agenda is installed, the Corporation can advance and ultimately score it. Note: A remote server can have only one agenda or asset installed in it at a time. If the Corporation wants to install an agenda in a remote server that has an asset or an agenda already installed in it, he can install the card but must trash the existing card first as part of the install action. The Corporation does not have to trash upgrades in order to install an agenda or an asset. Assets - An asset can only be installed in a remote server. If the Corporation wants to install an agenda in a remote server that has an asset or an agenda already installed in it, he can install the card but must trash the existing card first as part of the install action. Upgrades - An upgrade can be installed in any server. When an upgrade is installed in a central server, it is installed in the central server's root. Unlike an agenda or asset, there is no limit to the number of upgrades the Corporation can install in any server, central or remote. Note: The Corporation can only have one upgrade with the region subtype installed per server or server root, as listed in the text box of these cards. Ice - Ice can be installed in front of any server in order to protect that server. After a piece of ice is installed in front of a server, it is dedicated to that server and cannot be moved or rearranged. When the Corporation installs a piece of ice, he must install it in the outermost position in front of the server and pay an install cost equal to the number of pieces of ice already protecting that server. The outermost position is the position farthest from the server, in front of any other pieces of ice that are protecting the server. When installing ice, the Corporation can first trash any ice protecting that server in order to reduce the install cost. Then, he installs the new piece of ice in the outermost position in front of the server. 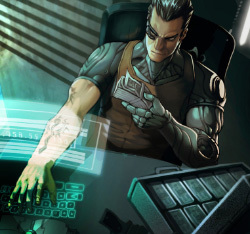 For one click, the Corporation plays an operation from his hand by paying its play cost. He then places it faceup in his play area, immediately resolves the effects of the operation, and trashes it. For one click and one credit, the Corporation adds one advancement token to an installed card. Agendas can always be advanced while installed. Cards other than agendas can only be advanced if their text box allows it. There is no limit to the number of times a card can be advanced. Note: If a card's text box says that the card can be advanced, the card can be advanced even when the card is unrezzed. Scoring Agendas - When the number of advancement tokens on an agenda is equal to or higher than its advancement requirement, the agenda is fully advanced and the Corporation can score it. The only times the Corporation can score an agenda is right before his turn begins, or after he completes an action. To score an agenda, the Corporation turns it faceup and places it in his score area, resolving any conditional abilities on the agenda that use the language "When you score". The Corporation cannot score an agenda until it is fully advanced. Scoring an agenda does not cost a click and is not an action. While an agenda is in the Corporation's score area, it is active and adds its agenda points to his score. Delayed Scoring - An agenda sometimes has an ability that rewards advancement beyond the agenda's advancement requirement, or an ability that encourages the Corporation to delay scoring the agenda. The Corporation is not required to score an agenda immediately upon satisfying its advancement requirement. He may instead advance it more, or wait for a more opportune time to score it. If the Runner is tagged, the Corporation can spend one click and 2 credits to choose one of the Runner's resources and trash it. For 3 clicks, the Corporation removes all virus counters hosted on cards, returning them to the token bank. Some cards have abilities with trigger costs that require the Corporation to spend one or more clicks. These abilities list the click icon in their trigger cost, and the Corporation can trigger these abilities only during his Action phase. The Corporation begins the game with a maximum hand size of five cards, but card effects can increase or decrease this limit. If the cards in HQ exceed the Corporation's current maximum hand size at the beginning of the Discard phase, he must discard down to his maximum hand size. If the Corporation must discard more than one card from HQ, he chooses and discards cards from HQ one at a time until he is no longer above his current maximum hand size. Cards discarded from HQ are always sent to Archives facedown, regardless of whether they have been previously accessed by the Runner. After the Corporation completes his Discard phase, the Runner begins his turn. Action Phase: The Runner has 4 clicks with which to perform actions. Discard Phase: The Runner discards down to his maximum hand size, if necessary. In his Action phase, the Runner takes actions by spending 4 clicks. He can only take actions during his Action phase, and he must spend all four of his clicks during his Action phase. The Runner can perform any of the following actions as many times as he likes, and in any combination, provided he can pay for them. These are listed in the format of "cost: effect". one click: Draw one card from the stack. one click: Gain 1 credit. one click: Install a program, resource, or piece of hardware. one click: Play an event. one click, 2 credits: Remove one tag. one click: Make a run. Whenever the Runner spends clicks on one of these actions, he is considered to be taking an action and cannot take another action until the current action fully resolves. When the Runner has spent all of his clicks, his Action phase ends and his Discard phase begins. For one click, the Runner draws the top card from his stack and adds it to his grip. For one click, the Runner takes 1 credit from the bank and adds it to his credit pool. For one click, the Runner installs a single program, resource, or piece of hardware faceup in his rig. 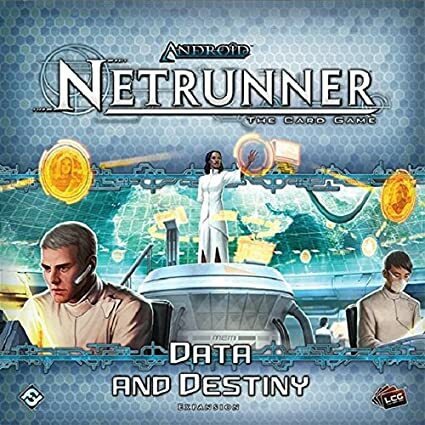 An installed Runner card is active and does not have to be rezzed like a Corporation card. Note: The Runner's cards are always installed faceup and in a vertical orientation. Programs - To install a program, the Runner pays the program's install cost and places it in his program row. Each program also has a memory cost. The Runner cannot have programs installed that have a combined memory cost greater than his available memory units (MU). The Runner begins the game with four MU, though certain card effects can increase or decrease this value. If the MU costs of the Runner's installed programs ever exceed his available MU, he must trash his installed programs until he is no longer exceeding his available MU. The Runner can choose to trash any number of his installed programs at the beginning of an install program action. Resources - To install a resource, the Runner pays the resource's install cost and places it in his resource row. There is no limit to the number of resources a Runner can have installed. Hardware - To install a piece of hardware, the Runner pays the hardware's install cost and places it in his hardware row. There is no limit to the amount of hardware a Runner can have installed. Note: The Runner can only have one piece of hardware with the console subtype installed at a time, as listed in the text box of these cards. For one click, the Runner plays an event from his hand by paying its play cost. He then places it faceup in his play area, immediately resolves the effects of the event, and trashes it. For one click and 2 credits, the Runner removes one of his tags. 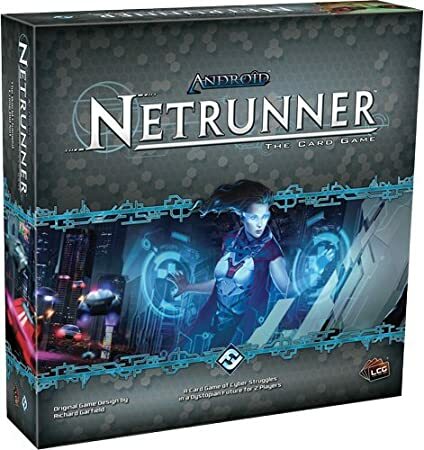 For one click, the Runner initiates a run against the Corporation in order to steal the Corporation's agendas and trash his cards. Some cards have abilities with trigger costs that require the Runner to spend one or more clicks. These abilities list the click icon in their trigger cost, and the Runner can trigger these abilities only during his Action phase. The Runner begins the game with a maximum hand size of five cards, but card effects can increase or decrease this limit. If the cards in the Runner's grip exceed his current maximum hand size at the beginning of the Discard phase, he must discard down to his maximum hand size. If the Runner must discard more than one card from his grip, he chooses and discards cards from his grip one at a time until he is no longer above his current maximum hand size. After the Runner completes his Discard phase, the Corporation begins his turn. Check here for all information about runs. Check here for all information about traces and tags. Meat damage: The Runner randomly trashes one card from his grip for each point of meat damage done to him. Net damage: The Runner randomly trashes one card from his grip for each point of net damage done to him. Brain damage: The Runner randomly trashes one card from his grip for each point of brain damage done to him, and his maximum hand size is permanently reduced by one card. The Runner takes a brain damage token to track this. Note: The only differences between net and meat damage are the cards that inflict and prevent them. When the Runner trashes multiple cards for damage, the cards are placed in his heap in the order they were randomly trashed. If the Runner takes more damage than the number of cards in his grip, or if he has a maximum hand size of less than zero at the end of his turn, then he is flatlined and the Corporation wins the game. If at any time a player has seven agenda points in his score area, he immediately wins the game. 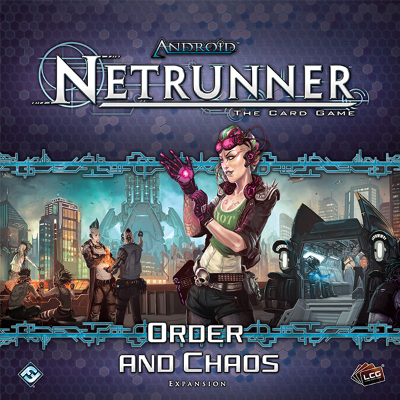 If R&D contains no cards and the Corporation attempts to draw a card, the Runner immediately wins the game. If the Runner is flatlined, the Corporation wins the game.